Dear Sisteroo reader: You didn't really want a post on healthy food, did you? Neither did I. When I make a treat, it is in all actuality 100% NOT healthy. I know some of you like to put apple sauce in recipes in exchange for butter, delete this and that ingredient, maybe even replace chocolate chips with raisins (this is a crime to all woman-kind that must be stopped)...none of that for me. These two treats are much healthier than store-bought options as I'll explain later in the post, but I don't hold back on real ingredients to make them (which means they taste fab!). As my Mom taught me long ago, satisfy your cravings within reason; I do, and I'm happier and over-all healthier for it. The following recipes are indeed homemade “snacks,” with “snack” meaning—You can fit one serving size into your wide-open mouth (though it may take some extra chewing and please don't choke). Compare this with a full serving of dessert: I, for one, cannot put a large piece of cake in my mouth at one time, thus, it is not a “snack,” but a dessert/meal/I eat less dinner so I can eat more dessert. Now for the Wowzah! What are these heavenly balls of sugar-coated cake goodness, you ask? Read on for my French Breakfast Puff recipe and Actress's Homemade Chocolate Almond Granola. If you like donut holes and churros, you will LOVE these French Pastry Puffs. They are as easy to make as a batch of muffins and are so delicious you'll have to have at least 3 to start (but don't worry, the mini size is the best). There is nothing fried about these puppies, so before you grab that over-cooked, under-sugared churro on your way out of Sams Club or Costco, consider making these for your family. They are a perfect addition to a breakfast or brunch and they taste even better cold from the fridge. 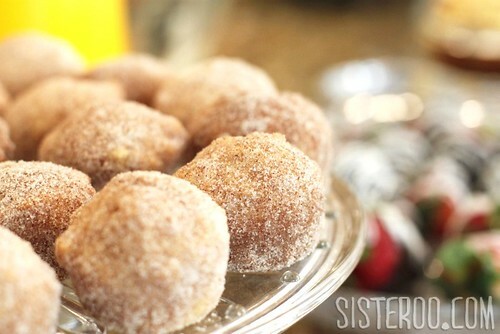 My French Breakfast Puffs recipe comes from a great blogger/chef: The Pioneer Woman. Visit her at thepioneerwoman.com. She has an excellent “hearty food” cookbook, The Pioneer Woman Cooks, which I love. 1. Preheat oven to 350 degrees. Lightly grease your muffin pans or use paper muffin cups for easy clean-up. Please consider doing all of these puffs in a mini muffin pan—they taste so much better small and look waay cuter. 2. In a large bowl stir together flour, baking powder, salt, and nutmeg. Set aside. 3. In a different bowl, cream together 1 cup sugar and shortening. Then add eggs and mix again. 4. Add flour mixture and milk alternately to creamed mixture, beating well after each addition. 5. Fill prepared muffin cups 2/3 full. Bake at 350 degrees for 20-25 minutes or until golden (minis will cook faster). 6. In a bowl, melt 2 ½ sticks butter. In a separate bowl combine remaining sugar and cinnamon. Dip hot baked muffins in butter coating thoroughly (if you used paper muffin cups be sure to remove these first because you will want the whole puff coated), then coat with cinnamon-sugar mixture. I find it easiest to put two or three minis in my cinnamon sugar bowl and roll them around with a spoon or gently move the bowl in a circle motion to “toss them” with their coating. Yield: 1 batch=60-70 minis, or 12-16 regular cupcake-sized. Other optional ingredient ideas: sesame seeds, raisins, craisins, white chocolate chips. 2. Mix together all ingredients except chocolate and dried fruit. 3. Place parchment paper over a rimmed baking sheet (so nothing spills). Spread granola evenly over the parchment paper. 4. Bake at 300 degrees for about 40 minutes. Stir/flip the granola every 10 minutes for even baking. 5. Wait for granola to completely cool (you can refrigerate it for faster cooling) before adding chocolate chips or dried fruits. 6. Granola can be stored in an air-tight container outside of the fridge for several weeks. 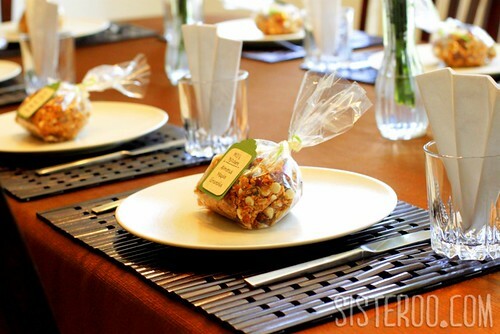 Serve in a munchie bowl, as a topping for ice cream or breakfast cereal, or tie-up in clear bags with ribbons as a gift. Can't wait to try the granola! As a welcome recipient of Actress's french puffs AND chocolate granola, I can say they are both DELICIOUS!!! I ate all of my granola and the husbands bag...it was that good! 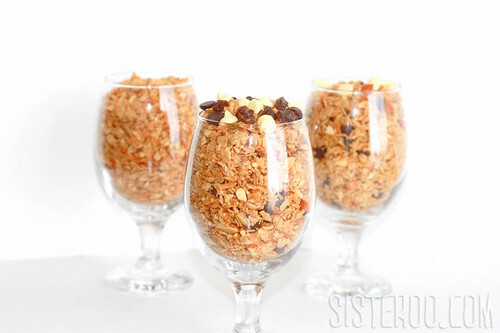 Dried fruits make a tasty addition to the homemade granola recipe. I tried the granola with some dried blueberries and YUM! Great recipe! So glad you liked the recipe, Rhela! I love the blueberries addition--I'm definitely trying it on my next go-around! I just recently started experimenting with making my own granola so this recipe comes at the perfect time. Can't wait to try the delicious result!